THE THIRD CRUSADE IS OVER Richard the Lionheart is bound for England. But with all the princes of Europe united against him ...can the greatest warrior in Christendom make it safely home? THE LION IS CHAINED Captured. Betrayed. Imprisoned. 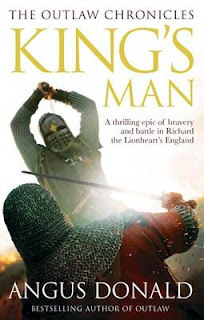 King Richard's slim hope of salvation rests on one man - a former outlaw, a vengeful earl, a man who scoffs at Holy Mother Church: ROBIN HOOD The mission is deadly, the enemy all-powerful, but for King and country Robin and his loyal lieutenant Alan Dale will risk all - from blood-soaked battlefields to deadly assassins - to see the Lionheart restored to his rightful throne. With the myth of Robin Hood having been written and rewritten for nearly a millennia, any author who tackles it now has to bring something new to the fore in order to not only make their mark but also to generate a character that will strike a chord within. What Angus has done is take one of the minor characters, Alan Dale and bring him to the forefront and present the hero in not only a more believable light but one that the reader really can’t help but like. It is almost as if the mythical outlaw has aquired the readers trust and given it to Angus himself. The book is beautifully written and with this, the third part in Angus’ epic story, its continued to grow along with the characters as historical events are not only cleverly interwoven within the mythos and whilst Angus admits to changing the odd part to fit, it’s a story that benefits more for these changes. Add to this a classy storytelling style, spartanesque prose, cracking overall arc which when blended with his own writing style really generates something special. All in, this is a book that I couldn’t put down and had immense fun reading. Angus really has done the legend justice and with his own brand of wit, it’s a series that you really have to read.